Home Gymnastics Beam is a Thing! You might have noticed . . . Gymnasts don’t lose the urge to flip, jump, and stand on their hands the minute they leave the gym. Fortunately for your furniture, you can create an upside-down space for gymnastics in your home that does not include your couch. Interested in purchasing some home gymnastics equipment for your aspiring athlete, but not sure where to start or what to buy? Might I suggest a balance beam! A gymnastics beam for the home is arguably the most applicable, affordable, and safest piece of home gymnastics equipment! Let’s Gab about what beam is right for your needs! Consider purchasing a beam mat if . . .
You are buying for a young child (6 and under). Beam mats accommodate smaller bodies & challenge younger minds. Find fun uses for beam mats here. Your gymnast has yet to declare their commitment to the sport. Beam mats are a relatively low investment and can enhance a child’s desire to play gymnastics at home. You are looking for cute, practical decor. Beam mats come in an array of bright colors and are a fun accent for playrooms and bedrooms! Consider purchasing a floor beam if . . .
You have little or no room for storage. Floor beams can easily be stored under furniture. Many models fold in half providing opportunities for “out of sight” storage. You are looking for portability. Floor beams transfer inside/outside, upstairs/downstairs, or to another home and back with ease. A excellent pack-along for vacations too! Your child has fear. Floor beams allow gymnasts to gain confidence through repetition. Because height is not a factor, gymnasts can focus on technique and accuracy of beginning and intermediate skills. Consider purchasing an 8 Ft. Beam if . . .
You have adequate space. An 8 ft long gymnastics beam is a reasonable option for many families. This is an adequate length for practice of individual skills such as handstands, cartwheels, back walkovers, etc. If later you have more space or desire competition beam length (16 ft), purchase an adjourning second beam. Your child likes a challenge. Low beams provide a comparable feel to workout beams used at the gym, more so than floor beams or mats. Note that a high beam is not necessary (or recommended when practicing at home). You desire a variety of uses. Low beams are great for practicing skills, conditioning, and games. Consider purchasing a 12′-16′ beam if . . . Your gymnast is older or at a higher skill level. Older/taller gymnasts will require more length when practicing skills. Don’t forget to purchase mats! You desire a beam comparable to your gym’s equipment. Competition beams are 16 ft in length. 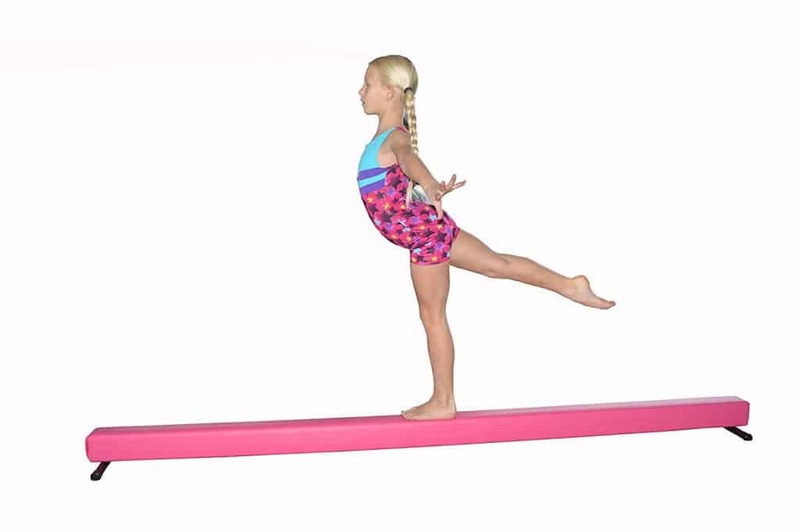 Routines are choreographed to use the entire length of the balance beam. Gymnasts wanting to practice choreography will benefit from a 12 or 16 ft length. You view this purchase as a long-term investment. Several 6 & 8 ft beam options can be combined to create a more significant length (allowing for the longevity of use). If you know you have space, funds, and desire the benefits, then purchase the longer beam.